Chilmark softball from a bygone era. From the April 11, 1997 Vineyard Gazette. While Mr. Robinson patrolled second base, his wife, Rachel, was combing the Connecticut suburbs for a family home. It was a painful search, derailed by racist brokers and neighbors who were afraid that selling to an African-American family — even to Mr. and Mrs. Jackie Robinson — would cause lower property values, block busting, or worse. These troubles were chronicled in a local newspaper, attracting the attention of neighboring ministers as well as Andrea Simon, a sharp-eyed, energetic community activist and the wife of publisher Richard Simon. Concerned citizens called a meeting at the Simon home. Almost immediately, a bond was struck between Rachel Robinson and Andrea Simon; later that afternoon, the pair went house-hunting together. This was a more fruitful search. On that afternoon, with her new friend Andrea in tow, Mrs. Robinson found the property of her dreams — just a mile down the road from the Simons. Thus began the relationship between the Robinsons and the Simons. The Robinsons stayed in the Simon family home while they waited for the completion of their own Stamford house. Andrea and Rachel were now close friends, sharing dinners and the company of their children — Peter, Carly, Joanna and Lucy Simon, and Jackie Jr., Sharon and David Robinson. The Simons also became dedicated fans of Jackie Robinson Sr., who was already a baseball legend. Ten seasons after he broke baseball’s color barrier, Mr. Robinson retired from baseball in 1956. This meant more time with his family in Stamford, plus a serious crash course in baseball for Peter, Carly and Jackie Jr.
“Jackie spent so much time teaching us about baseball,” Peter said. “We’d stand out in the backyard, and he’d hit us grounders with a tennis racquet and a tennis ball. He used to whale the ball and hit these towering high flies. Peter grew to be close with Jackie Jr., who was his age. For several Stamford summers and sleepaway camps, the two were inseparable, hanging out on lazy, hot days and hitting rocks into the Robinson family’s pond. Mrs. Robinson recalls many summer gatherings at the Simon home. Mr. Simon, who co-founded the Simon & Schuster publishing company, was a major figure in Manhattan cultural circles, and his backyard parties were often glorious affairs, with guests such as Benny Goodman and Jimmy Durante. Occasionally, these outdoor parties revolved around high-spirited baseball games. Thanks to Mr. Robinson, there is one particular game that Peter Simon will never forget. “When I was little, there was this woman named Lucy Monroe who used to sing the Star-Spangled Banner before every Dodgers home game,” he recalls. “I got very attached to her. I used to imitate her all the time and when she would sing on the television, I would tell everyone in the house to be quiet. Despite these unexpected, kindly gestures, Peter Simon remembers Jackie Robinson as a low-key person, a man who never sought fame or attention. As Jackie Jr. and Peter Simon grew older, they developed different interests and took separate paths. Peter became an avid photographer; Jackie Jr. enlisted in Vietnam where, sadly, he grew addicted to drugs. Upon his return, he successfully completed a rehabilitation clinic and became a youth counselor, only be killed in an automobile accident in 1971. But over these years, Rachel Robinson and Andrea Simon remained close. Richard Simon died in 1960, and Andrea — always an independent-minded, indefatigable soul — began spending more time on Martha’s Vineyard. Mr. Robinson also visited the Island a few times. Peter Simon recalled one such trip, when Mr. Robinson came to watch him play in a pickup softball game at the Menemsha School. Jackie Robinson died on Oct. 23, 1972, at the age of 53. Subsequently, Mrs. Robinson grew even more close with Andrea Simon; in addition to large families and fame, both women now shared the loss of a husband. It was a bond that lasted until 1994, when Andrea Simon died at age 84. “Andrea and I had more than a friendship — we were like sisters,” Mrs. Robinson said. But to Mr. Simon, this anniversary is a more personal moment. Beautiful story. Nice to read about everyday friendships between people of different races, simply appreciating each other’s individual humanity. I applaud the Jackie Robinson and Richard Simon families. Once again, Jason Gay hits it out of the park! Great story, Jason! 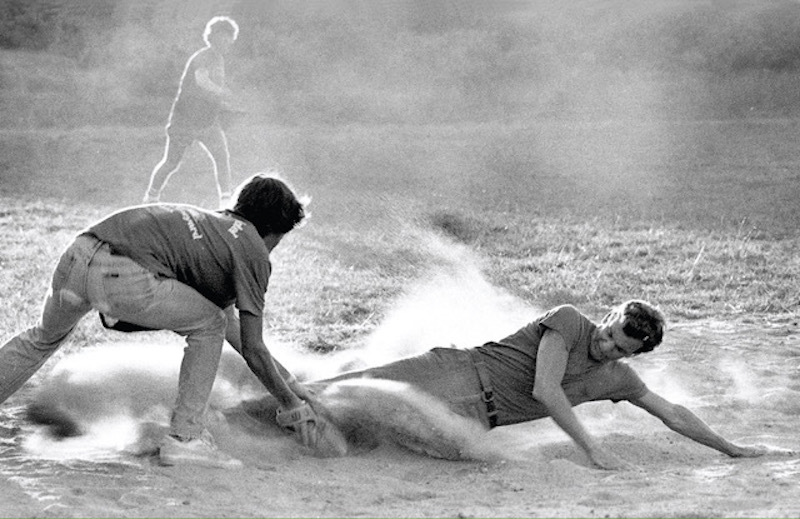 An addendum, as told by Chilmark softball commissioner, the late Bill Edison: Bill was pitching in a hotly contested Chilmark softball game, and his team was winning. The opposing team wanted to substitute a pinch hitter. Bill refused to allow this. (He was the commissioner, after all.) Bill's team won. Only later did Bill learn that the prospective pinch hitter had been the gr567eat Jackie Robinson, truly one of Bill's heroes. Bill told this story, with regret, for decades. What a beautiful story. Kudos to Mrs. Simon. Mrs. Robinson is grace and class. It breaks my heart to think people did not welcome the Robinson Family as neighbors. I'm sure Mrs. Robinson's kind words are a great source of comfort to the Simon family. Er, yeah..that’s my dad Bill! The way he told it to me, the score was tied in the bottom of the 9th and he had his back turned to Jackie: “NObody comes in at the bottom of the 9th,” he shouted. Only later did he turn around to see his biggest hero, whom he had seen play! Boy, was he devastated!